​So just how did Chicago celebrate? Well, Chicago Food Day kicked off its 2015 season with characteristic high energy on Thursday, October 22 at the downtown Farmer’s Market. Surrounded by area farm stands, natural food vendors and Chicago Food Day sponsors and exhibitors, Interactive Health CEO, Cathy Kenworthy, led a rousing talk about the importance of a real food diet for healthy lifestyles shortly before the launch of Hidden Harvest, Chicago Food Day’s popular social media treasure hunt. Two live Hidden Harvest hunts led from the stage put the crowd on its feet and marked the official start of the social media drops scheduled across the city over the next several days. 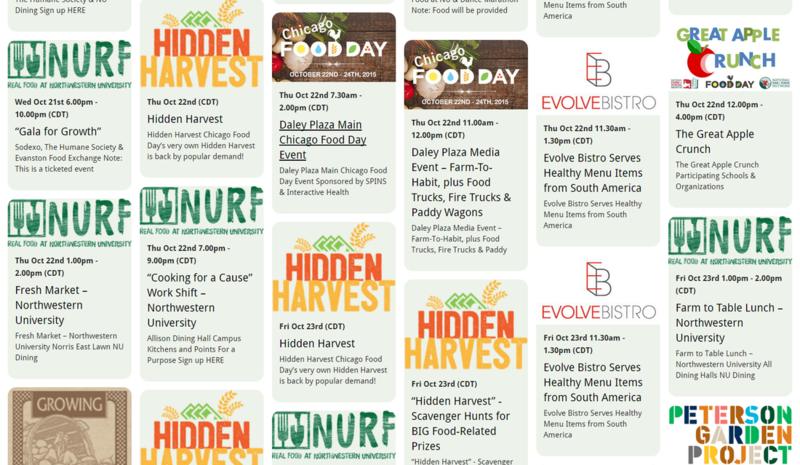 Northwestern University loved Hidden Harvest so much they took the week to celebrate Chicago Food Day and conducted their own campus-based series of Hidden Harvest drops! Supporters and participants then took to the stage to grab an apple from a large basket and supported the Illinois Farm to School Network’s Great Apple Crunch. The Chicago Food Day crowd joined more than 50 Illinois school districts by taking bites from their apples in unison. Chicago Food Day supporters and celebrants took to social media with posts and photos to share the great event with even more Chicagoans! Chicago Food Day celebration activities have included movie screenings, cooking classes, urban farm tours and other exciting events at notable venues. 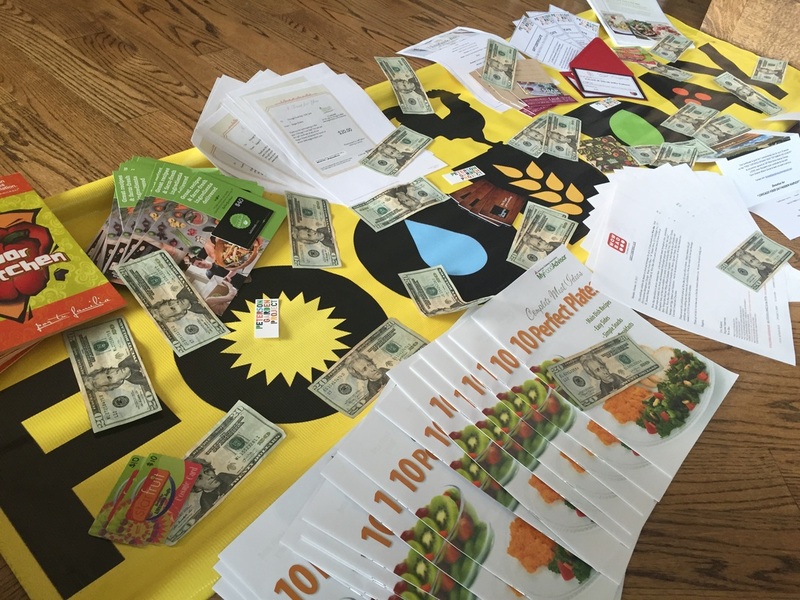 Heartfelt thanks to the amazing sponsor of Chicago Food Day 2015 – Interactive Health as well as all of our Hidden Harvest Partners & Exhibitors. 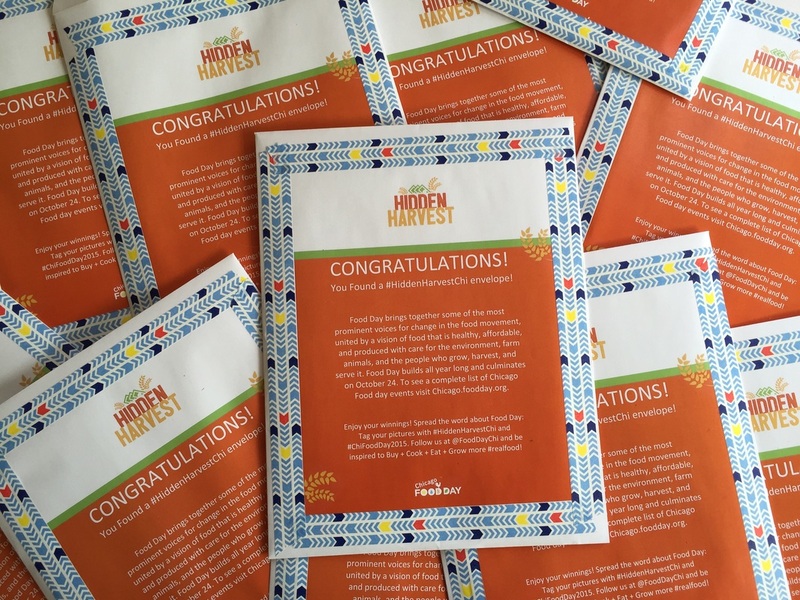 Also, CONGRATULATIONS to all of our Hidden Harvest winners!! To see a gallery of Chicago Food Day 2015 images and pictures, visit our gallery!